Since the Chennai Super Kings won in the IPL 2018, they were all set to host IPL finals this year at the MA Chidambaram Stadium in Chennai. 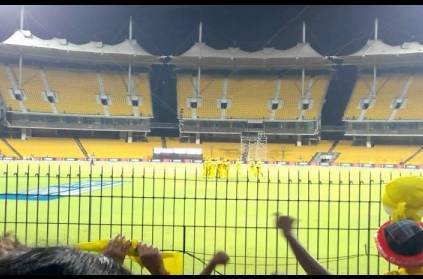 However, we know that there is an issue with the three closed stands in the stadium and now the BCCI has said that, if this issue is not resolved, Chennai will not be able to host the IPL finals. The BCCI has Hyderabad and Bengaluru as back up venues and might host this year's finals if the issue remains unresolved. The Chennai fans will be hoping that these problems are cleared soon and Chennai will host the Finals. SandStorm at Jaipur!!! Will there be a Russell Storm? Delhi Capitals win after losing 3 wickets in 6 balls!! !RCB lose 6 in a row!!! This page contains news relating to various facts and events. The views are generally about current affiars and general topics in diversified areas such as political, international, national, and regional issues, sports, health, travel, lifestyle, technology and business. People having similar interets on the above topics will find this page useful. IPL finals may shift from Chennai due to closed stands problem | Sports News.